Aninhado na floresta, cercado por pinheiros, encontra-se uma cabine isolada de 3 quartos em Leech Lake, Shingobee Bay, quatro milhas ao sul de Walker, MN. Um lugar muito privado, luxuoso e pacífico e um ótimo local para pescar, nadar, relaxar e absorver a natureza. Nossa cabine fica situada no bosque de 20 hectares, com vista para a baía de Shingobee. Descanse na rede, desfrute de refeições ao ar livre dentro da varanda ou no convés, mergulhe na jangada, relaxe na doca 20x10, ande ou ande de bicicleta pelas estradas arborizadas ou trilhas na floresta, caiaque no lago e observe os mergulhões. Bicicleta ou snowmobiling em trilhas de asfalto ou preparadas que conduzem a Walker e a Floresta Nacional Chippewa. Leech de peixe para dorso, muskie, pique, crappie ou peixe-espinho; pergunte sobre a casa de peixe. Óptima pesca a partir da doca. Traga seu próprio barco ou alugue um em Walker. Kayak está disponível. Bicicleta para o asfalto Paul Bunyan Trail a uma milha da cabine. Sente-se junto à fogueira, faça s'mores e assista os vaga-lumes. Sair no alpendre de três estações e ouvir o vento. A cabine de espera tem uma varanda blindada 11X20. As janelas de imagem alinham o lago. Um convés envolve o lado do lago e metade da casa. Rodeado por jardins exuberantes, pinheiros altos e uma variedade de madeiras duras. Doca, lavadora / secadora, máquina de lavar loiça, ar central, lugar de abeto, churrasqueira Weber, amaciante de água, TV 42 "com videocassete e DVD, três quartos para 7 pessoas. É o lugar feliz das nossas famílias que decidimos compartilhar. E-mail ou ligue com perguntas no número de telefone abaixo. We stayed at the property for a week In August 2018. It was well supplied and maintained. The location was great - it felt secluded, but it was easy to go into Walker. The bay was pretty quiet and you felt like you were on a smaller lake, but it was easy to get on to Leech. We have a 10 and 14 year old and they loved that you could fish and swim from the property. We would definitely go again. Thank you for the kind review. We enjoyed sharing our lake home with your family. We hope you can make it back someday. We were disappointed with the number of weeds around the shore and dock. It is not a property with a sandy area or lake bottom for swimmers to enjoy. Although the owner has been working on improvements, the basement toilet leaked all over the floor and had to be repaired during our stay. The spiral staircase is unstable with one of the support beams loose. The biggest disappointment was the expectation of renters to take trash into recycling center or haul it off to dump if it exceeded over half of a small trash can in the garage. Compactor was in garage instead of kitchen so trash had to be moved from kitchen bags into compactor bags in garage. We had difficulty making compactor work. Owner was upset we left bagged trash in garage beside trash can and charged extra beyond the rental and cleaning fees. Never expected to haul trash at other VRBO rentals—our family paid rent to enjoy lake not to spend our days finding trash dump. We won’t be returning. Thank you for noticing our improvements. Since you reserved your stay last winter, we actually did a complete kitchen remodel with all new stainless steel appliances, new windows and doors giving a 180 degree southwest view of the lakeshore, replaced all trim and doors with knotty pine, painted the main floor, added new lighting, upgraded to a new 55" TV, replaced the sectional in the basement, updated to 50GB high speed wifi, and installed a new gas fireplace in place of the wood burning fireplace, for easier access to ambience for our guests. We are sorry that our natural shoreline didn't agree with you. 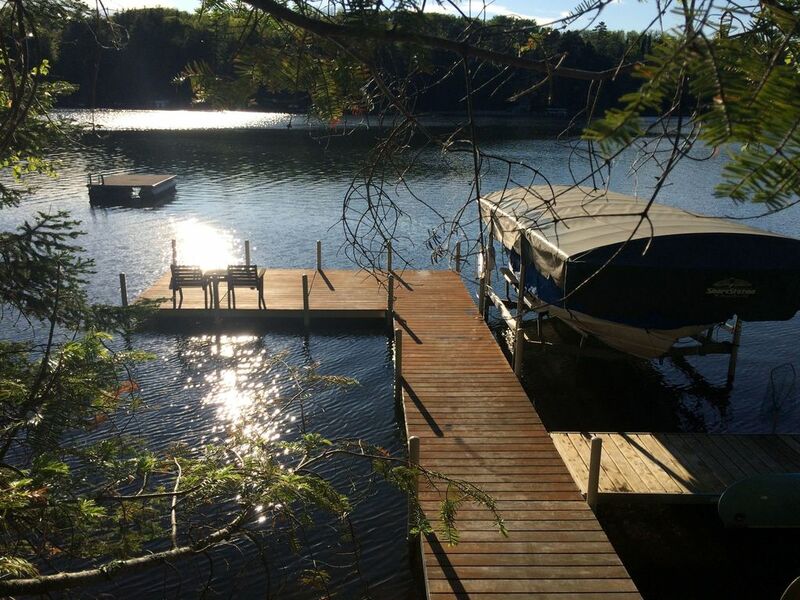 We have never advertised our shoreline as a sandy beach and for 12 years our previous guests have enjoyed the 10 x 20 foot platform at the end of the dock, our 8 x 12 foot swim raft, and swimming in between, as well as the fabulous fishing from the dock. Our circular staircase is made from oak and creaks, but is very solid. Thank you for letting us know the toilet was leaking, our plumber in the area was able to fix it within 36 hours from the time you called and the toilet was in the lower level bathroom. Getting to the real issue at hand, our cleaning service found 7 bags of garbage piled next to a full garbage can in the garage upon their arrival after your departure, which had accumulated in 3 days, as the garbage service picks up Wednesday morning. We have a garbage compactor in the garage, which can compact three full kitchen garbage bags, and the garbage can holds five full compactor bags. Had we been notified before your departure that the compactor was difficult to figure out, though this is the first time in 12 years of renting we have had an issue with our garbage system, we would have assisted you with the matter. We asked you what you would like to donate to our cleaning service for helping with the excessive garbage, after the fact, and upon your authorization, we withheld the amount you instructed us to donate to our cleaning service from your deposit. We enjoy open dialog with our guests, seek feedback and strive for continual improvements. We take pride in sharing our home with our guests. Cozy seclusion in Northern Minnesota! My husband and I needed to get away and I needed my "Minnesota Fix" as we call it. This cabin outside Walker, MN had the perfect combination of comfort with access to all things athletic. The dock is down a small flight of stairs and with Adirondack chairs, it's the perfect place for coffee in the morning and a glass of wine at night. There is a floating dock to swim to...the only downside is no sandy beach to ease into the water. We had some rainy days and it was fine to sit on the couch and read or do puzzles. The kitchen is more than adequate for cooking meals. The situation of this cabin to abundant black-topped trails is wonderful. One can hike forever through wooded areas or rent a bike nearby and bike...one of the trails is over 100 miles long. We were not fishermen, but if you love to fish and eat that fish...you're in the right place. Walker is a nice town with many restaurants to choose from and enjoy. Thank you Jonathan and Kate for your hospitality and for being in touch during our stay. We're so happy you were able to get your "Minnesota Fix" and are glad you enjoyed the seclusion our cabin offers. Thank you for your kind review and for being easy to communicate with during your stay. We hope you come back next summer! We had a week of fun, sun and great accommodations. This lake home had everything my family of five needed . We found most of our time was spent on the spacious dock and swimming in the lake. There are relaxing chairs where we all could sit around and watch the boats, loons and swimmers. We also caught perch, blue gill, rock bass and northern off the dock. The cabin upstairs and downstairs suited us great. We spent most of the cabin time in the screened deck. We ate in there, played cards and listened to the nice sound system. The kitchen had everything we needed, the appliances worked great, and the refrigerator is full-size. We also appreciated the nice TV, the abundance of movies and a fast internet. A lovely home surrounded by beautiful pine and birch trees. The double car garage was very handy to store the bike we brought for the Paul Bunyan trail along with our fishing and swimming gear. A lovely home to enjoy our vacation! Thank you kindly for your review -- so happy to hear you and your family enjoyed your time on Shingobee Bay! This property was the perfect location for our "Up North" getaway for a family of four (kids 11 and 13) . We even had space to accommodate a visit from grandma and grandpa for a couple of days. The home itself had everything we needed. The kitchen is smaller but well-equipped. While we didn't cook big meals, we were able to bake and use the stovetop, sometimes with a little improvising, but we always got the job done. Highlights were the screened porch where we spent a great deal of time, and the basement which is more updated and stayed nice and cool. We enjoyed the fire pit, the constant "visitors" to the bird feeders on the deck, as well as the flowers around the property. We even found fresh chives to put in our salad! The real draw for this property, however is the location. Shingobee Bay is a great spot for swimming, boating, and presumably fishing (although we didn't fish on our trip). If you want a spot that is a little larger, you are moments by boat from Walker Bay and then on to other bays and the enormous Leech Lake. You can boat into Walker and dock to visit the cute shops and many dining options. Of course, you can drive, too, and it is just minutes to get there. This cabin sits on a very large secluded lot. The dock area (including floating dock) was perfect for swimming, tying up a float, or sitting in the deck chairs to read a book. The cabin is also very close to the Paul Bunyan bike trails. The owners were very responsive and attentive during our stay. The next time we are headed "up north," their "Happy Place" will be ours again, too! Thank you for your review of your family's cabin stay. It's fun to hear that others enjoy all that Walker has to offer. This was our third time renting the cabin. We love Shingobee Bay, having spent a lot of family time there since the 1960s. The lake is beautiful. The bike trails are the best anywhere, right outside your door. The cabin is extremely comfortable with a fire pit in the yard overlooking the lake. We made good use of the basement TV room for movies at night. Kitchen is fully equipped. Dock and swim platform are great for warm summer days. Thank you for the very kind review. We appreciate your family visits to our home. Passeio de bicicleta para Paul Bunyan Trail (1 milha da propriedade. 1000 milhas de trilhas snowmobile preparado.